The Refugees, required first-year reading for the 2018–2019 academic year, addresses the experience of Vietnamese-American refugees as modeled on Nguyen’s personal history. Just as The Refugees expands its scope to include wider issues of immigrant identity and exploitation of Latino immigrants in the contemporary American landscape, so did Nguyen’s speech. Particularly, Nguyen spoke out against the concept of the ‘good’ and ‘bad’ immigrant, which he believes is being used even by those within Vietnamese-American communities to accept prior waves of immigration but dismiss the current issues of refugees from Central America and the Middle East. In addition to addressing the content of his work, the author was also able to talk about the mechanics of writing during a pre-speech craft talk with undergraduates in Lathrop Hall. Those present for the Q&A session are enrolled in English 360A (Living Writers), taught by series organizer Jennifer Brice, associate professor of English. 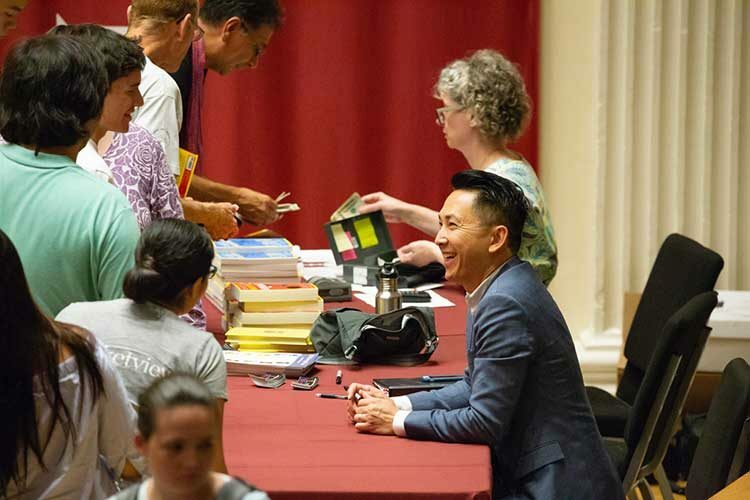 Later, on the Memorial Chapel stage, Nguyen ended his campus visit with a call for everyone in the audience to act as storytellers, whether professional or not, to ensure that their voices are heard as individuals. Living Writers continues this evening with Patti Smith.